The Board of Supervisors are working toward an ordinance to limit development via implementing a policy in the Carmel Valley Master Plan. The project would implement the Master Plan’s policy 39.1.6. The ordinance was adopted with stronger language. The Carmel Valley Master Plan (569K PDF file) was adopted by the Board of Supervisors in December 1986 and amended in November 1996. 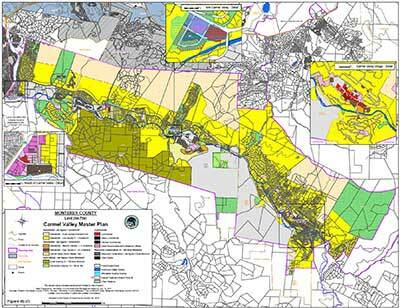 This map shows the Carmel Valley Master Plan Land Use Map. Without an ordinance implementing the General Plan policy growth will continue unabated in the Carmel Valley and decrease the quality of life of existing residents.